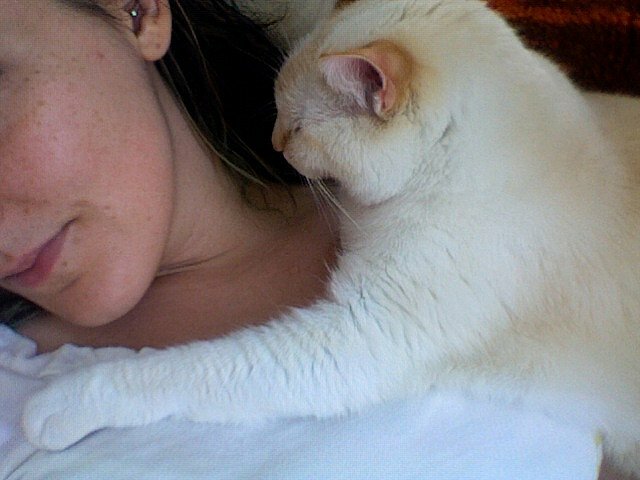 You are here: Home / Cat Behavior / Do Cats Really Hug People? Sometimes when I hold my cat like a “babe in arms,” he stretches up, he hooks his paws around my neck, and pulls me in. Is he really hugging me? Thomas: I guess the first question to ask is, do cats hug? Bella: It’s not something cats naturally do in the wild, although sometimes we do put our paws over one another if we happen to be snuggling. Thomas: Bella does that to me all the time, and I like it. Bella: And I especially love it when Thomas does it to me! Thomas: Long story short, Katie, although cats don’t instinctively hug one another, we do see how you humans express affection to one another, and sometimes we do use human affection gestures on you. Bella: Sometimes it seems like you humans don’t quite understand our feline gestures of affection like rubbing against your legs and stuff, so we need to make it a little more obvious how much we love you. Thomas: My sweet Dahlia (may she frolic forever in the catnip-filled fields of the Kitty Paradise) threw her paws around Mama’s neck when Mama first met her and picked her up out of the cage she was in. Bella: Dahlia was in a cage? How awful! Thomas: Oh, it wasn’t too bad. She and her brothers were “on loan” to a copy shop where Mama used to do business — the local shelter did that a lot to encourage people to adopt cats — and they were tiny kittens and it was a big cage. Bella: Oh, I guess that’s OK. I had to be in a cage for a bunch of sleeps when I went to the shelter and they wanted to make sure I wasn’t sick before putting me in with other cats. I didn’t like that very much! Bella: Oh, Thomas, it’s okay. Come over here and let’s have a snuggle. Thomas: Sometimes you remind me so much of Dahlia, I swear I’d think she sent you to us. Bella: Tee hee hee! I’ll never tell! Thomas: Anyway, Katie, yes, we’ve known cats who were “huggers” in the way you describe, and we do think it’s a way of expressing affection. Bella: We hope you enjoy your beautiful kitty and his happy hugs for many years to come! Thomas: What about you other readers? Do you have cats that hug you? What other kinds of odd gestures of affection do your cats do? Bella: Tell us all about it in the comments! Can Cats Tell How You're Feeling?